Unfortunately for some really great films their trailers do them an enormous disservice. 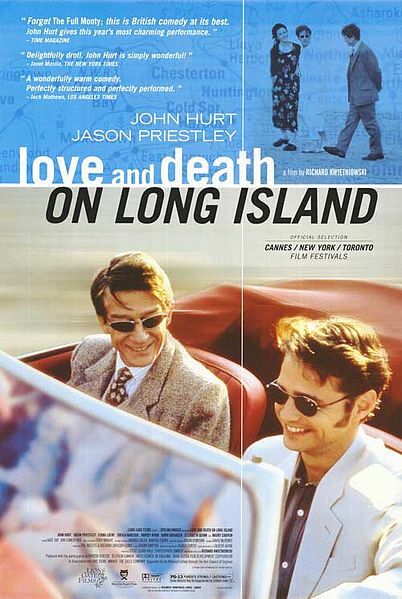 This was the case with Love and Death on Long Island. From the trailers I envisioned a totally different film then what I saw when I put the movie in. I was pleasantly surprised when I began watching Love and Death, it was touching without being pathetic and sappy. I actually found myself really drawn into the movie; I cared about the characters – more specifically, I cared what happened to John Hurt’s character. His performance made the movie for me, without him I wouldn’t have been so moved. Hurt took the “psycho” out of obsession for me. He played Giles down to something human and not dangerous and sick. Although he was so old, and Ronnie so young, he never came across as a “dirty old man.” There was something very young about his character – something very like a teen girl: watching all of Ronnie's movies repeatedly, memorizing all Ronnie's sats, switching his brand of cigarettes to the Chestertons because Ronnie lives in Chesterton, etc. Jason Priestly, on the other hand, gave his usual poor performance. I see no talent and no emotion in him. His character seemed so flat and dull. I could hardly even imagine what Giles saw in him, and I think Giles realized that when he met Ronnie – he was nothing but a pretty face. The film was filled with subdued humor. Hurt’s dream sequence in which he was on a game show, his subject: the life of Ronnie Bostock, was particularly funny. Giles’s leap into the 90’s was funniest to those who know someone that is so cut off. This was a bit more extreme humor than the rest, but it played just as well. Without the humor, Giles would have been much less of a character. And his obsession would have seemed more dangerous then sweet.